Body oils have been a staple in my beauty routine for several years now. After every shower, I always apply a handful of thick, moisturizing oil from head to toe, focusing on key dry spots such as my elbows and knees. A lot of times, though, I end up using a wee bit too much (especially if the body oil isn’t housed in a pump jar), so I was excited to try this convenient spray-on body oil from CapriClear. I’ve tried one other dry oil spray before and loved it, but it was loaded with some fillers that left me no choice but to eliminate it from my to-buy list. 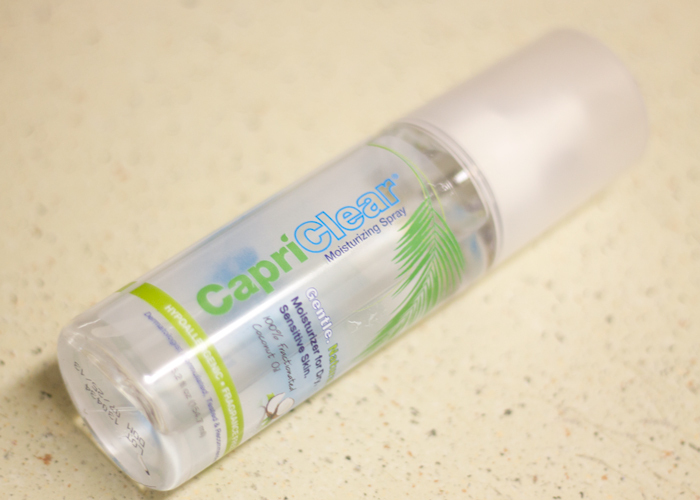 CapriClear Moisturizing Spray, though, has just one simple ingredient: Fractionated coconut oil. For the record, the official listing on the bottle is Caprylic/Capric Triglyceride (100% Fractionated Coconut Oil). In case you missed my post on coconut oil for beginners, fractionated coconut oil is coconut oil minus the medium-chain triglycerides. That means that while this coconut oil is odorless (no familiar coconut smell here), it’s not virgin, pure coconut oil — but that’s OK! in search of a lightweight body oil — the fractionation process thins out the coconut oil, making it a no-brainer for use all over your body before bedtime or before getting dressed on a tight morning schedule. While CapriClear Moisturizing Spray isn’t the most beautifully packaged body oil I own (it kind of sticks out among a sea of Osmia Organics, May Lindstrom Skin and Skin & Bones body oils), it’s one that I reach for a lot on busy mornings when I need to just be able to spray, rub and go. I also love that CapriClear Moisturizing Spray is scent-free; with my recent foray into searching out the best natural perfumes, I don’t want my body oil competing with my scents. CapriClear Moisturizing Spray is just one of those no-nonsense, economical oils that is great for daily use or for introducing your friends to the power of natural products. CapriClear’s creator, board-certified dermatologist Dr. Betty Bellman, also gets a finger-snap from me for being one of those cooler derms who listens when her clients ask for natural solutions to skin issues — which is what lead her to making this multipurpose moisturizing fractionated coconut oil spray. While CapriClear Moisturizing Spray probably isn’t a product I’d be drawn to on my own, after trying it, I’m convinced this is my new go-to spray oil for those low-maintenance days when I just don’t have time to fuss over myself. The pricepoint is fair and its gets the job done — sold. What sort of coconut oil do you use on your skin? Have you tried CapriClear or any other coconut oil sprays? Tell me in the comments section!